Kotak Mahindra Bank is one of the largest private sector banks in India. The bank provides highest interest rate on savings bank account and in addition to this, the bank recently took over ING Vysya Bank. In order to log in to your account through net banking, you need to have your CRN Number. The CRN Number is also known as the customer ID or the Customer Relationship Number. 1. You must read the article before you start looking for the CRN Number on the documents and the welcome kit provided to you by the bank. So to find the CRN Number, you need your debit or the credit card. 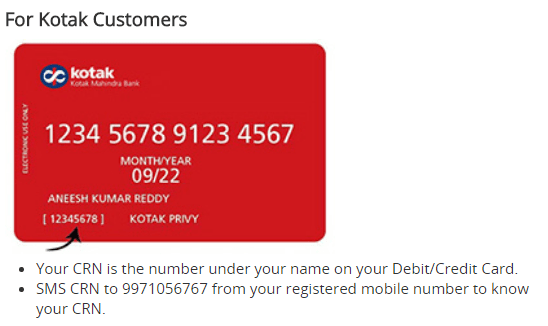 Now, if you opened your bank account directly in Kotak Mahindra Bank then you can find the CRN Number just below your name on the credit or debit card. It would be an 8 digit number. 2. 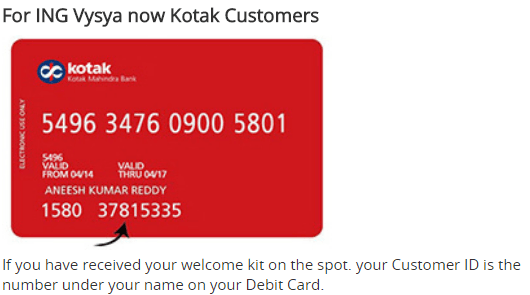 If you were previously an ING Vysya Bank customer and your account has been migrated to Kotak Mahindra Bank then you can find the customer id in a similar way (image shown below). Note: If you do not have your debit or credit card at the moment then you can also SMS 'CRN' to 9971056767 and you will get the CRN Number through SMS. It should be noted that you must use your registered mobile number for the process. If you do not have your registered mobile number with you then you can find the CRN Number on the welcome kit provided by the bank. Having CRN Number will help you in logging on to the net banking and you would also require the CRN Number for filling any sort of application in the bank. I forgot my CRN number my mobile number is 8796985039. I want my crn number. I need CRN number cannot recover it through SMS. can I share my CRN number to anyone? sir Kotak 811 app my mobile number already registered but the message, We are unable to process your request at this mobile number is not registered with us. Please try again with your registered mobile number. please CRN number. I forgot crn number for Kotak 811 account how to recover it fast. How to get my crn no when we have dose not registered mobile number. I need the CRN number my register mobile number 8655849689 plz. I need the crn number my registered mobile number is 7834942404 please send me to bank a/c number. I don't have money on my mobile for taking CRN number. what can I do? I need the crn number my registered mobile number is 9971287398 please send me crn number. tap on creating 811 accounts again enter aadhar card number then it will show ur name, crn number by saying already created by this. I need the CRN number my registered mobile number is 9866656669 please send me CRN NUMBER. SMS 'CRN' to 9971056767 from your registered mobile number. I also didn't get my crn number, Can you send me please my crn number on my mobile no. ?? when i try to login with crn number its showing error.. If you do not have your debit or credit card at the moment then you can also SMS ‘CRN‘ to 9971056767 and you will get the CRN Number through SMS. It should be noted that you must use your registered mobile number for the process. I AM T MOHAN I NEES THE CRN NUMBER MY my register mobile number IS 8800975762 please send the CRN no. i want to open kotak net banking online so Send me CRN number. Kotak bank ...worst service ....worst.. i am unable to get kotak 811 crn number. I need loyal bank CRN number..
i need the CRN number my register mobile number this 9743478255 please send the CRN no.